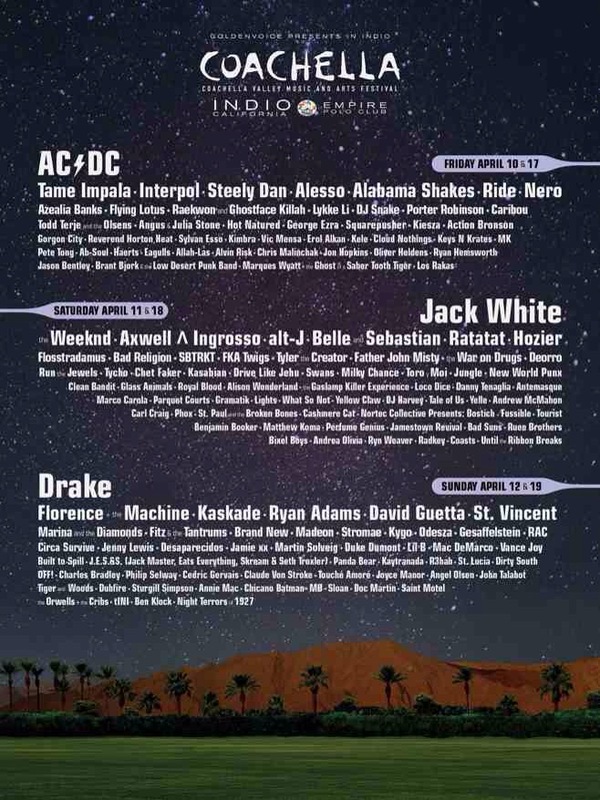 The 2015 Coachella line up and ticket sale dates have finally been announced! The music festival which takes place in Indio, California, USA includes a variety of artist in the line up from different genres of rock, hip-hop, and electronic dance music. This year’s headliners include AC/DC, Jack White, and Drake. The tickets go on sale January 7th at 12pm PST and the festival will once again be 3 days long. You can choose to attend Weekend 1 from April 10-12, or Weekend 2 April 17-19, 2015. Coachella, which has been my personal favorite festival so far, offers the option to camp on site which I highly recommend. Camping let’s you hang out and meet other festival goers which is half the fun. If you’re lucky enough to get your hands on a ticket, Coachella is going to be 3 days of great music, art, and making awesome memories.